Black Friday is just about upon us, and already the deals are pouring in from across the Web. But do you dive in now, or do you bide your time until the day itself? Are the current prices really as low as they’ve ever been, or can they get even better? Deal-hunting on Black Friday (and the week leading up to it) can feel like a high-stakes game, so we’re here to make it a little easier by showing you the best tools and websites for monitoring items and tracking down the best prices. 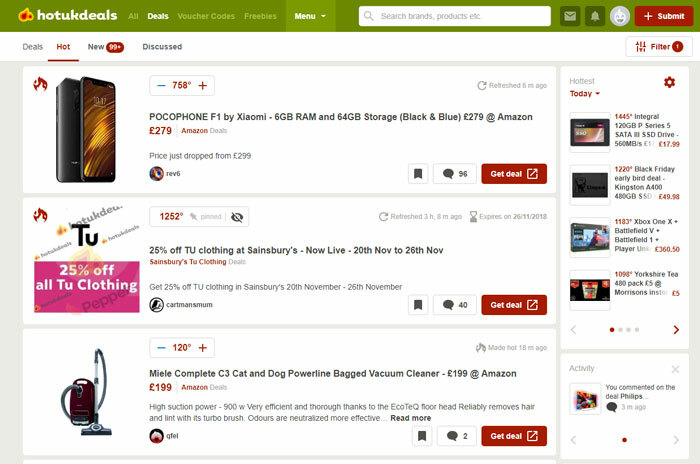 The Pepper network is a bunch of websites dedicated to giving the savviest bargain-hunters a platform to share the best deals they find on the Internet. There is no pushed content here, just thousands of items found online and in-store by dedicated communities who really know their stuff. The best deals are given “heat” by readers, so each day you can see which ones are top of the pile (though you can also search for specific items and categories, of course). The US-based Slickdeals and UK-based Hot UK Deals follows a similar principle, though isn’t owned by Pepper. You can set up your own keyword feed on these sites, too. Just create a free account, then go to “Settings -> Keyword Alerts or Deal Alerts” or similar. (It varies a little between sites.) Here you can enter keywords like “ps4 pro,” “office chair” or whatever, set a minimum temperature that you want the item to reach before getting notified, then click “Create new keyword alert.” You can get the site to email you deals that meet your criteria or just check into the site and look at your “Keyword feed” manually. If you want a more algorithmic approach to tracking down the best deals, then you can’t go too far wrong with the list here. Camel Camel Camel focuses specifically on Amazon, syncing with your Amazon wishlist to deliver price updates on the things you want to buy, as well as showing you all the historical price data of Amazon products, letting you know whether you’re getting the best price possible. 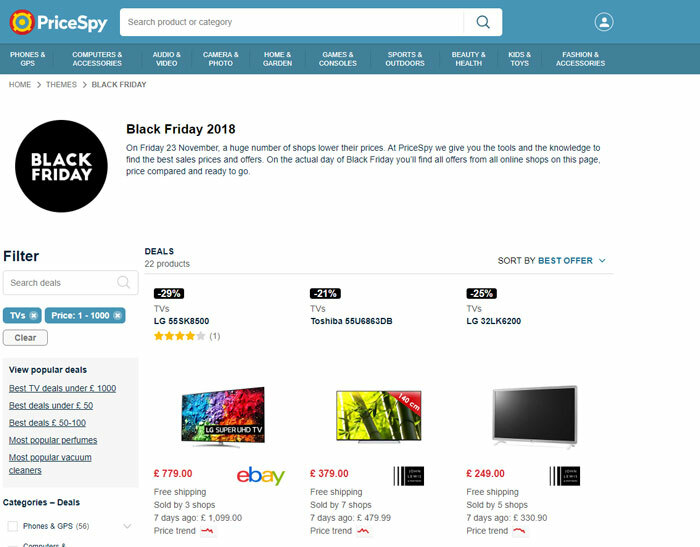 Price Spy is a UK site that’s a little broader than Camel Camel Camel, in that it covers a much bigger range of reputable websites as well as Amazon. It shows you the biggest price drops, lets you look at historical price data, and assigns all kinds of price alerts and filters. If you’re looking out for some digital gaming deals on Black Friday, then the best thing you can do is use one of the price trackers dedicated specifically to digital games stores. Is There Any Deal may not look pretty, and regardless what country you’re in, it’s the most robust price-tracking tool you’ll find for games. Is There Any Deal lets you create a “Waitlist” where you set a price that you want a game to drop to before receiving an alert. There are variables you can set, such as choosing whether you want the game to be DRM-Free or Steam-activated, and it also lets you see the game’s historical price data so you have an idea of how good the deal is that you’re getting. Cheapshark is another international game price tracker that has a more elegant interface, and on its homepage it shows you all the biggest price drops on the biggest digital stores at that moment. 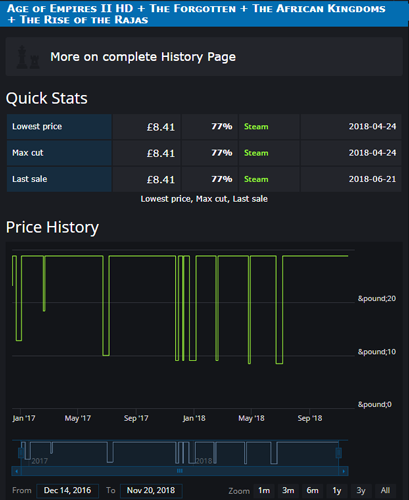 It doesn’t let you tinker as much as Is There Any Deal, but you can still look at historical price data and search for games by various filters. These are our favorite deal sites, though there are of course others. What makes these great is that there’s no product advertising or promos there – just great deals that have been picked out by communities and cold, effective algorithms. If you think you have a better method of tracking the best deals, let us know below. NEXT POST Next post: Why is it called Black Friday?